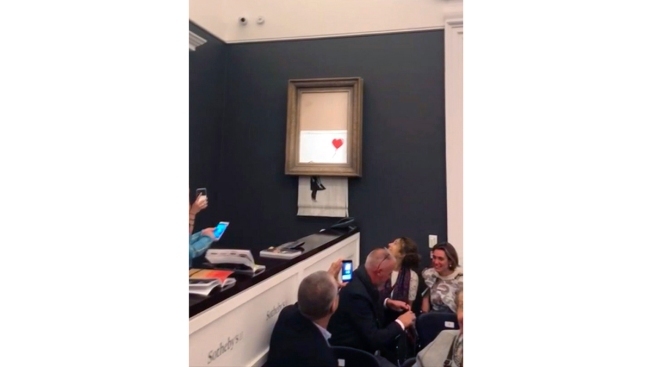 In this file image taken from video on Friday, Oct. 5, 2018, people watch as the spray-painted canvas "Girl with Balloon" by artist Banksy is shredded at Sotheby's, in London. Sotheby's says the winning bidder for a Banksy painting that self-destructed during an auction last week has decided to go through with the purchase. The auction house says a female European collector was the successful bidder who offered 1.04 million pounds for "Girl With Balloon." Just after the hammer came down, the bottom half of the work passed through a shredder concealed in the frame. Sotheby's said Thursday, Oct. 11 the painting is being sold with a new title, "Love is in the Bin." Banksy posted a new video to his website Tuesday implying the partial shredding of his "Girl With Balloon" at a London auction was supposed to have been complete. The video shows the famously anonymous artist constructing the shredding mechanism inside an ornate frame and pushing a button in a black box to activate the destruction at Sotheby's in London earlier this month. The act shocked the crowd, but the winning bidder, a European collector, went ahead and bought it anyway for $1.4 million, according to the auction house. Sotheby's did not name the buyer. The partial shredding drew speculation that the act was a stunt to increase the value of the painting of a young girl reaching for a heart-shaped red balloon. The canvas was shredded to right above the girl's head, leaving the balloon intact. The end of the new video notes: "In rehearsals it worked every time..." A complete shredding of the same design is then shown. The nearly 3-minute long video is titled, "Shred the Love, the Director's cut." It shows hands and a hooded figure (Banksy is fond of hoodies) constructing the mechanism in a studio space, then it rolls on to the outside of Sotheby's before the auction. People milling about sipping Champagne and nibbling hors d'oeuvres are next up, including some standing in front of the painting. The auction and partial shredding are shown, as is the work being taken off the wall at Sotheby's and carried out of the room. Banksy has never disclosed his full identity. He began his career spray-painting buildings in Bristol, England, and has become one of the world's best-known artists. His mischievous and often satirical images include two policemen kissing, armed riot police with yellow smiley faces and a chimpanzee with a sign bearing the words, "Laugh now, but one day I'll be in charge." His "Girl With Balloon" was originally stenciled on a wall in east London and has been endlessly reproduced, becoming one of Banksy's best-known images.